This paper, based on a case study of Chinese temples in Phuket, aims to demonstrate the importance of religious activities lying outside “religion” in the so-called “Buddhist” societies in Thailand, as well as to question the category of “religion” itself. In Thailand, most of the Chinese temples (called sanchao in Thai) are not recognized as “religious places” by the religious administration (namely the Department of Religious Affairs), since they come under the supervision of the Ministry of the Interior. In Phuket, Chinese temples as “non-religious” places (of worship?) outnumber officially recognized Buddhist temples and they offer occasions for the worship of Buddhist deities. One of the unique features of the “Buddhist” activities of the Chinese temples in Phuket is that they are conducted without monks. Because the Chinese temples are placed outside the state protection of “religion,” they are not institutionalized as belonging to any state-approved religion. This is beneficial to the Chinese temples as they do not have to compete with “state Buddhism”; in such temples indiscriminate syncretic worship is also latently sanctioned. In Phuket the functions of Chinese associations and charity foundations overlap with those of the Chinese temples, challenging the definition of religion in yet another way. Our discussion leads us to conclude that all these activities lying outside of “religion” actually occupy an important part of “Buddhism” in Thailand. Thus a reconsideration of the framework of “Buddhism” and “religion” in Thailand is necessary. This paper aims to reconsider discussions on “Thai Buddhism” from its margins—from the perspective of Chinese temples. One of my motivations for presenting this paper is the existing debate on Thai Buddhism and Chinese societies in Thailand. There is a well-established model for approaching Thai Buddhism—one that stresses the importance of the Sangha and how Buddhist society maintains its equilibrium through the merit-oriented practices of laypeople, which supplement the nirvana-oriented orthodoxy by monks (Ishii 1986). This model is very clear and consistent. Of course, Sangha-centered Buddhism officially supported by the government is only one part of real Buddhism in Thailand, and ritual practices related to spirit worship are well documented and repeatedly discussed.1) In my paper I extend this trend of academic attention to the margins of Buddhism, to question the very categories of Buddhism and religion. I refer to Chinese temples, which are supposed to form a large part of the religious activities of statistical Buddhists in Thailand, but which are not seriously argued. In this paper I will first review the development of the modern category of religion and government policies toward it, and show that Chinese temples have not been included in this system. Then I will turn my attention to the findings from my case study in Phuket, one of the regional cities that have been developed mainly by Chinese immigrants. An overview of the current situation of Chinese temples in Phuket will be presented before further discussions on the status of Chinese temples and related activities as “religion-as-non-religion.” I will proceed to connect arguments on the anonymous nature of “Chinese Religion” to the unique allocation of religious discourse in Thailand, and demonstrate that it is this combination that leaves Chinese temples in Thailand in the domain of “non-religion.” Finally I will show the possibilities for further comparative studies of religions in Thailand in order to rethink the conventional understanding of religion in Southeast Asia. Prior to the administrative reform in the last half of the nineteenth century, the term satsana, which denotes religion in the present sense, was a synonym of Buddhism. Kings enjoyed the title of “the Supreme Defender of Satsana,” with satsana denoting Buddhism exclusively in this context. As in other Asian countries, “religion” as a neutral term of comparative religion is a relatively recent invention in Thailand. Furthermore, a feature of Buddhism in pre-modern Thailand was the absence of nationwide monastic institutions. The vast majority of the land was dominated by semi-independent local crowns, and the King’s direct rule was limited to royal temples around the capital. This situation changed dramatically after the Sangha Administration Act was introduced in 1902. This act brought about present-day Thai Buddhism as a uniform institution, which Ishii calls “State Buddhism” (1986, 59). It officialized and standardized a set of regulations on the doctrine taught in monasteries, as well as the status of ordained monks, and organized these monasteries and monks into a single bureaucratic pyramid officially sanctioned by the central government. Extension of the coverage of the term satsana took place alongside the modernization of Theravada Buddhism. One of the first turning points was the “Edict of Religious Toleration” issued by King Chulalongkorn in 1878 (Wells 1958, 59–64). This royal edict was targeted at the evangelical works of Christian missionaries in Chiang Mai, the northern capital of present-day Thailand. This edict referred to Christianity as “Satsana Phra Yesu” or “Satsana of Jesus,” and manifestly stated that one’s satsana was a matter of freedom of faith (Prasit 1984, 169). King Vajiravudh, the successor to Chulalongkorn who governed the kingdom in the early twentieth century, established and propagated the state ideology: “chat, satsana, phramahakasat” (nation, religion, monarchy). In this context satsana is Buddhism as the de facto state religion. According to Vella, this propagation of Buddhism was based on the king’s assumption that the Thai people have historically selected Buddhism among religions of essentially equal standing: “Time after time the King pointed out the basic similarities of all religions. All religions taught their adherents a similar moral code; they taught men to do good, not to harm others” (Vella 1978, 220–221). For this young monarch, educated in England, Western-style religious pluralism was already a self-evident truth. After the constitutional revolution in 1932, the king’s title as “the Supreme Defender of Satsana” persisted with the introduction of the idea of “freedom of satsana” or “freedom of religion.” These contradict each other so far as satsana is defined as Buddhism. The usage of satsana to denote religion in general can be traced to this period. The phrase “protection of satsana” in the constitution was translated in English as “protection of all religions professed by the Siamese people,” and thus was established the system in which religions enjoyed equal status under royal patronage. “[I]n this light, the semantic expansion of satsana is probably best understood as an accommodation of the traditional values to the context of Western, European democracy” (Ishii 1986, 39). In 1941, a Department of Religious Affairs (Krom Kansatsana) was created under the Ministry of Education to supervise all religions recognized by the state or all religions under royal patronage. It replaced the Krom Thammakan, which had formerly superintended violation of the Buddhist precepts by monks (Sutthiwong 2001).4) In 2002, it was transferred to the newly created Ministry of Culture, while some of its functions relating to the administration of Buddhism were carved off for the equally new National Office of Buddhism. Religious organizations officially registered with the Department include Islam, Christianity (Catholic and Protestant as separate categories), Brahmanism, Hindu, and Sikh, as well as Buddhism. As for Buddhism, the Thai Sangha (Theravada) and two Mahayana sects (“Chinese” Chin Nikai and “Vietnamese” Annam Nikai, though both are actually Chinese) are listed in the religious statistics of the government (Thailand, Krom Kansatsana 1998). This brief summary of the development of religious administration in Thailand shows that the traditional model of state administration for Buddhism has been extended to cover other religions as satsana has been redefined as a general term for religions. The consequence of this development is the concentration of the state’s interests in the registration and control of ordained religious professionals and their facilities. Laypeople are left out of the scope of the religious administration, and the minimum requirement for laypeople is simply to select one religion on their ID cards. In addition, such self- declaration of one’s religion does not require details of one’s affiliation or allegiance to any sect or denomination. In other words, the exact number of Theravada and Mahayana lay followers among Buddhists is not known. It is also worth noting that Confucianism and Taoism are not listed among the officially recognized religions. The only choice offered by the state to the Chinese (with the exception of small numbers of Christians and Muslims) is Buddhism. Where, then, is the place for Chinese temples within these officially recognized religious categories? The answer is that there is no place for them since Chinese temples register with the Ministry of the Interior, not the Department of Religious Affairs under the Ministry of Education (after 2002, the Ministry of Culture). The Chinese temple that I refer to in this paper is an English translation of sanchao Chin, which is strictly distinguished from ordinary Buddhist temples called wat. The Chinese temple must seek legitimacy on grounds other than the religious administration. Legally speaking, government control of Chinese temples is based on an order issued by the Ministry of the Interior in 1920. This order was originally aimed at supplementing the shortcomings of the Local Administration Act (1913), especially Article 113 on the protection of property rights of public places for merit-making (kusonsathan). Article 2 of the ministry’s order defines sanchao (Chinese temples and other shrines) as “places to have objects of worship and used for rituals according to doctrines (latthi) of the Chinese and other people.” The Department of Local Administration has the duty of supervising Chinese temples listed in the Directory of Chinese Temples in the Kingdom published by the department (Thailand, Krom Kanpokkhrong 2000). A comparative study of Chinese temples of Bangkok and Singapore by Pornpan and Mak (1994) presents unique data of the historical development of Chinese religions in Thailand. According to this study, the number of Chinese Buddhist temples in Bangkok is smaller than in Singapore. The authors suppose that this is because Buddhism is much better established and flourishing in Bangkok than it is in Singapore—Theravada monasteries were so scattered over the kingdom that the lack of Mahayana temples would cause no serious problem for Chinese immigrants. Scholars have long agreed that the cultural distance between Chinese immigrants and host majorities is remarkably small in Thailand in the sense that both parties are more or less Buddhists in a broad sense. The case of Chinese immigrants who show no hesitation in claiming themselves to be Buddhists has been reported in many academic writings on Chinese in Thailand: “[O]bservers are impressed not so much by differences as religious similarities between the Thai and the Chinese minority,” and “unlike the situation with respect to the Chinese in other countries of Southeast Asia, in Thailand religion does offer one base on which cultural compromise is being achieved” (Coughlin 1960, 92). Some Chinese folk traditions even contributed to such cultural compromise. As Skinner (1957, 129) points out, San Pao Kong (Sanbaogong 三保公), one of the popular Chinese deities, has another name Cheng Ho (Zheng He 鄭和, a leader of Ming China’s maritime expedition), while his name also symbolizes the three essentials of Buddhist teaching, San Pao 三寶 (Three Treasures), since these two terms share the same pronunciation. That cultural compromise between Chinese immigrants and the host Thai Buddhists was easily achieved partly explains the delayed introduction of Chinese Mahayana monasteries to Thailand, since Chinese temples of folk religion and Theravada monasteries filled the religious needs of the Chinese Buddhists. In Bangkok, the first Chinese temple established in 1786 was dedicated to Pun Thao Kong 本頭公, a deity of locality worshipped in Southeast Asia (Pornpan and Mak 1994, 28–29, 137). All the Chinese temples built in the first half of the nineteenth century were temples of Taoism or local folk beliefs, while Chinese Mahayana Buddhist temples were introduced much later. The first Chinese Mahayana temple of Thailand was established in 1887 (ibid., 29). Actually, only four Mahayana temples5) in Bangkok were built before 1915 (ibid., 140). All these facts indicate that Mahayana Buddhist temples were an absolute minority among the Chinese temples at the time of the legislation of the Sangha Act (1902) and the Interior Ministry’s order (1920). Another factor behind the legal status of Chinese temples is the government’s policy towards Chinese immigrants. As Nipaporn (2012) argues, Chinese immigrants’ activities in the public sphere were almost neglected by the Bangkok government in the initial period of modernization (late nineteenth to early twentieth century). Most of the infrastructure of public welfare for the Chinese settlements was initiated and provided by associations of speech groups (or coalitions of them), not the royal government, on a self-supporting basis (ibid.). Such welfare organizations have a tendency to overlap with Chinese temples. For example, the Cantonese Temple and Cantonese Hospital of Bangkok are located in the same compound as the Cantonese Association. Tianhua Hospital 天華醫院, which was jointly founded by five speech groups (Swatou, Canton, Hokkian, Hakka, and Hailam) in 1905, has a large Kuan Im 觀音 temple in its center. Po Tek Tung or Baode Shantang 報徳善堂, founded in 1910, is the largest philanthropic association in the kingdom as well as a temple for the worship of Dafeng Zushi 大峰祖師, a former Mahayana monk in China famous for his devotion to public activities (issues on philanthropic associations will be discussed later). Also, this philanthropic association is the owner of Huachiao Hospital 華僑醫院. Such associations “provide the Chinese population with schools, community centers, hospitals, clinics, temples, cemeteries and recreational facilities” (Coughlin 1960, 33–34). Unlike Theravada monasteries, Chinese temples began in Thailand as a welfare center for this neglected community lying outside of government care. Later, a series of government policies towards the Chinese was legislated during the reign of King Vajiravudh, for example, the Association Act (1914) and the Private School Act (1918). Although these legislations sound universal, they were actually targeted at gaining effective control of the Chinese immigrants (Vella 1978, 189–190). The Association Act was “aimed particularly at preventing the formation of Chinese associations reflecting the new political enthusiasms generated by events in China” (ibid., 189), and “[w]hat the private school law of 1918 was supposed to do was facilitate the assimi- lation of Chinese” (ibid., 190). Similarly, even though the Interior Ministry’s order on sanchao under Vajiravudh’s reign is a regulation measure on shrines in general (Chinese and non-Chinese alike), Article 2 (mentioned above) shows that its first target was actually Chinese temples. This ministry’s order also forms a link in the chain of contemporary policies to enforce a strict policing of the Chinese by legitimizing their activities and organizations. According to Koizumi (2007, 33–44), Chinese community leaders in Bangkok initially tried to resist the legislation on Chinese temples and petitioned the govern- ment for amendment of the acts. The petitions presented to the government were finally rejected on the grounds that strict state regulation was necessary because Chinese temples might harbor secret societies and other illegal activities. Since the “Chinese problem” was a matter of policing rather than purification of “State Buddhism,” and since Mahayana monasteries were an absolute minority even among the Chinese temples, most of the Chinese religious facilities (temples and semi- religious associations) have been dropped from issues of religion and placed in the hands of the Ministry of the Interior. According to the government policy toward the Chinese immigrants, Chinese temples or related organizations might register as an association with no political intention or as a Chinese temple outside “religion” (unless it has no ordained monk). Chinese immigrants have been periodically victimized by the Bangkok government’s nationalistic policy. In the early twentieth century they were suspected to be troublemakers instigated by Sun Yat-sen’s republican ideology, and later they were viewed as potential communists in the Cold War period (Skinner 1957). Indeed, throughout the twentieth century, the Thai government did not offer a special category to Chinese religions to register as religions. A good example is Dejiao 徳教, which was introduced to Thailand from China in the early 1950s. This is a syncretic religious movement that originated in post-World War II China and spread to Southeast Asia. In spite of its unique tradition and the religious connotation of its name jiao means religion), the official status of its branches in Thailand is “philanthropic foundations,” and it has never been recognized as a religion. Since the beginnings of this religious movement in the 1950s, the Thai Government “severely controlled registration of new Chinese associations, especially those whose stated purpose involved religious activities” (Formoso 2010, 59–60). Table 2 shows the number of Buddhist temples according to each sect, recognized by the Department of Religious Affairs (in 1998). Official data on Buddhist sects contain only temples and monks, and the number of laypeople is not disclosed. This reflects a state interest in religious affairs that is almost exclusively concentrated on the control of temples and ordained monks. As already mentioned above, in official statistics, laypeople are never classified according to sects. Another remarkable feature of this data is the very small number of Mahayana temples (Chinese and Vietnamese). This is partly because similar facilities tend to register with the Ministry of the Interior as sanchao or Chinese temples (and are thus non- religious places). Indeed, Chinese temples (657 temples nationwide) outnumber Mahayana temples, even though their number and the number of their followers are never listed in government statistics on religion. From these statistics, we can suppose that the Chinese people attending Chinese temples declare themselves as Buddhists (who make up 93.3 percent of the total population, see Table 1) in population statistics. other than those expected by institutionalized Thai Buddhism. The percentage of the population of Phuket province in the national total is 0.4 percent and that of Buddhist temples is much lower (0.1 percent), whereas that of Chinese temples is 1.5 percent (10 out of 657 state temples). 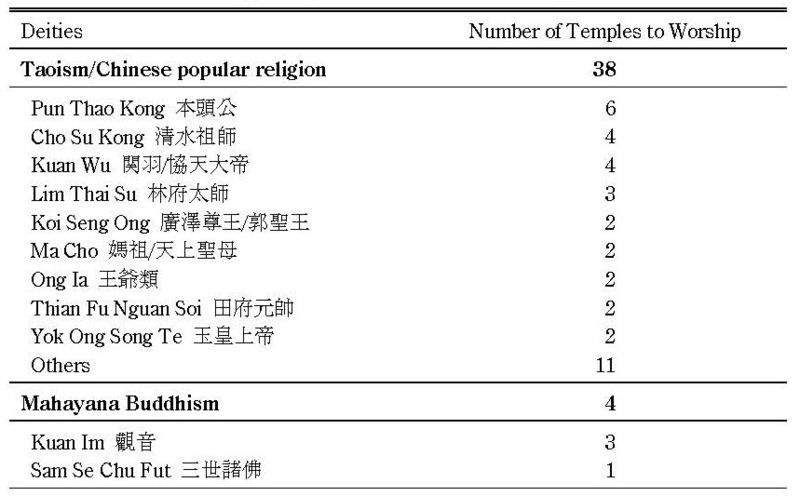 These figures indicate that Chinese temples are more concentrated than Buddhist temples in Phuket. Since Phuket province has no Mahayana Buddhist temple, all the Chinese temples in Phuket are non-religious places in the official sense. Their legal status falls into three categories: state, private, and non-registered. The difference between state and private temples lies in land ownership. Temples located on state-owned land are categorized as state temples, and those on private land are private temples. Currently there are 10 state Chinese temples, 14 private temples, and at least 18 non-registered temples in Phuket. Apart from Chinese temples, there are six temples dedicated to Muslim guardians of locality. As I will discuss later, these temples and the deities in them are closely connected to Chinese temples. All the Muslim guardian temples are non-registered. The situation of the Chinese temples of Phuket tells us that non-registered temples are by no means exceptional. Many Chinese temples are excluded from the registration system of Chinese temples by the Ministry of the Interior, which is itself beyond the religious administration of the state (the Department of Religious Affairs). In fact, state control of religion based on the official definitions of satsana and satsanasathan has only a very partial hold on religious facilities. Which deities are worshipped in these “non-religious” places? 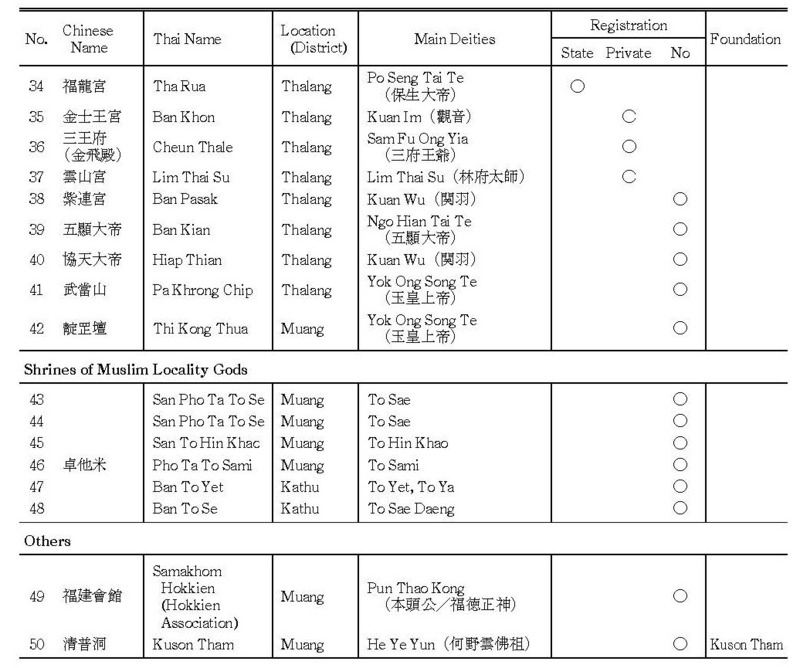 According to Tables 5, 6, and 7, showing data on deities worshipped in the Chinese temples in Phuket, the most popular deities as owners of temples are Pun Thao Kong (Bentougong 本頭公 or Hude Zhengshen 福徳正神, worshipped in six temples), Cho Su Kong (Qingshui Zushi 清水祖師, worshipped in four temples), and Kuan Wu (Guanyu 関羽, worshipped in four temples). These are followed by Lim Thai Su (Linfu Taishi 林府太師) and Kuan Im (Guanyin 觀音), each worshipped as an owner deity in three temples. Taoism or Chinese popular religions outnumber Buddhism at the level of owner deities of temples. However, this does not mean that Buddhism is not important in Chinese temples. The vast majority of temples (26) have Mahayana Buddhist deities in their pantheon as lesser objects of worship. 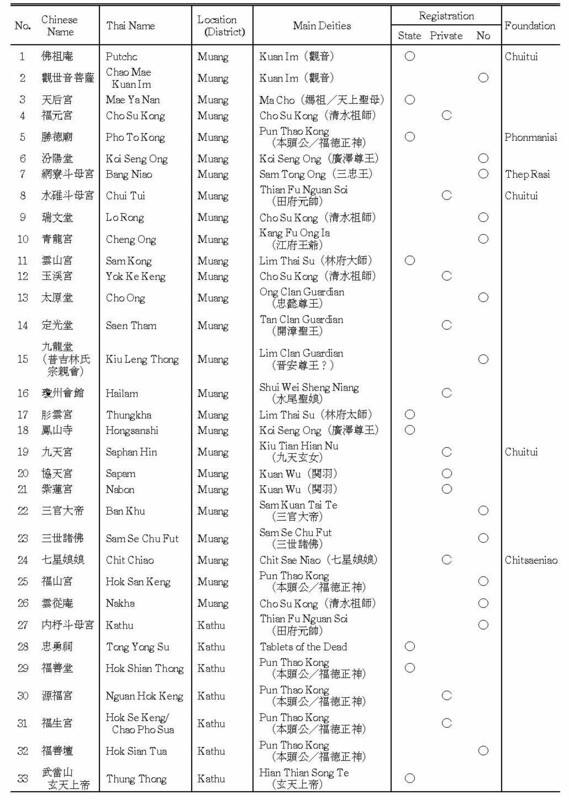 Of these 26 temples, all have Kuan Im, and some have an additional Mahayana Buddhist object of worship such as Mitreya 弥勒佛, Ti Chong Ong 地蔵王菩薩, and other Bodhisattvas. Some temples are more oriented to official Buddhist temples. A good example is Sam Se Chu Fut temple (No. 23 in Table 7). Although this temple is officially a non-registered sanchao, the structure of its pantheon is actually very Buddhist. Sam Se Chu Fut 三世諸佛 or the Three Buddhas of the Mahayana school are its owners, while the majority of its lesser deities are also Mahayana Buddhist deities. The difference between this kind of sanchao and Buddhist temples (wat) lies in the absence of ordained monks and daily chanting carried out by lay practitioners in the latter. Worship of Buddha and Buddhist deities can be practiced in most of the Chinese temples, even though these temples are never recognized as Buddhist “religious places.” These sanchao, or Chinese temples as non-religious places, offer alternatives for the practice of Buddhism outside state sanction. One could also worship deities of several religious traditions other than Mahayana Buddhism at these temples. Former Theravada monks constitute the objects of worship in the pantheons of Chinese temples in Phuket. The most prominent of these monks is Luangpho Chaem, who was active in the late nineteenth century and is purported to have supernatural powers. His picture is still worshipped all over the province, including in two Chinese temples (No. 4 and No. 13 in Table 7). In Lo Rong temple (No. 9), one can worship various images of former Theravada monks as well as other deities, Buddhist and non-Buddhist. The structure of the pantheons of some Chinese temples is almost ecumenical. Lo Rong is an example of such a “department store” of religious amalgam. Yok Ong Song Te (Yuhuang Dadi 玉皇上帝), Nine Emperor God or Kiu Ong Tai Te (Jiuhuang Dadi 九皇大帝), Lao-tze (Taishang Laojun 太上老君), Ma Cho (Mazu 媽祖), Sam Tong Ong (Sanzhongwang 三忠王), Pun Thao Kong, Sakya Muni, Kuan Im, Mitreya, Ti Chong Ong, ancestor gods of the Tan and Koi clans, Phra Phran (the Thai name for a god of Brahmanic or Hindu tradition), and other popular gods, in addition to the Theravada monks men- tioned above, are all found in one single temple. Another example is a very small temple Hiap Thian (No. 40), dedicated to Kuan Wu, Kuan Im, Siva, and Uma Devi. The composition of its pantheon reflects the founders’ intention to unite three Asian religions, namely Chinese popular religion, Buddhism, and Hinduism. Islamic tradition is sometimes also invited into such mixed pantheons. Muslim guardian spirits of locality are worshipped as lesser deities in five Chinese temples. This custom stems from the belief that the founders (and, as such, guardians of locality) of the island of Phuket were Muslim. The Chinese, as newcomers, thus had to ask the founder spirits for permission to settle. Since then, these guardian spirits (called to) have been placed in Chinese temples in typical Muslim attire, including the Muslim costume and cap. Symbolized by a crescent and the color green, these spirits receive offerings (with prohibitions on pork and liquor) on Fridays, and are said to speak Arabic on occasions of possession. The Phuket Chinese see this custom as a way to pay respect to the local Muslim tradition, although the worship of images through the offering of joss sticks causes protests from some strict Muslim leaders. Temples No. 43–48 in Table 7 are not regarded as Chinese temples, but temples of Muslim guardian spirits of locality. Nonetheless, they are closely related to the Chinese temples in the composition of their pantheons. They share the same deities as the Chinese temples; Chinese-style altars of Thi Kong 天公 (Heaven God, sometimes referred to as Yok Ong Song Te) are placed in front of the temples; images of Kuan Wu, Kuan Im, Mitreya, and Ho Ia (Huye 虎爺, a land spirit) appear in assistance of the Muslim guardians, which are themselves worshipped in some Chinese temples under the same names (To Sae, To Tami, To Saming, etc.). Indeed, in Chinese temples we find deities from Theravada Buddhism, Mahayana Buddhism, Taoism, Hinduism, Islam, Chinese popular religion, and local spirits worshipped together in one place. However, this description may be misleading, since the pantheon of the Chinese temples in Phuket seems to reject the very demarcation of institutionalized religions. For outside observers, it is almost impossible to identify each temple’s religious affiliation in institutionalized terms. This causes no problem, however, since these places are not officially recognized “religious places.” Chinese temples are simply “non-religion” and there is thus no need for the identification of religious affiliation. Another unique aspect of “Thai Buddhism” practiced by the Chinese in Phuket is that most of the ritual practices in Chinese temples are conducted without ordained monks. Ritual specialists are laypeople with various titles like ajarn shifu, songjingyuan and so on.9) They chant Chinese sutras in the Hokkien dialect, known locally in Hokkien Chinese s songkeng 誦經. Since Phuket has no Mahayana temple, there is no alternative of inviting Mahayana monks for songkeng. This songkeng is clearly distinguished from suat mon, which denotes the chanting of Pali sutras by Theravada monks. One of the occasions for songkeng to take place publicly is Pho To (Pudu 普度),10) a ritual widely practiced all over the island whereby offerings are made to the dead during the seventh lunar month. In Phuket City, Pho To is celebrated in eight places annually (Table 8)—four in Chinese temples, two in a former Chinese temple, and the remaining two on community streets. The Pho To ritual is based on the belief that dead persons come back to this world during the seventh lunar month. Those with descendants will go back to their homes while others with no place to go may eventually harm living people. Note: * The Thaihua School Campus was formerly a Chinese temple and the headquarters of the Kian Tek secret society. ** Propitiation ritual for deceased Kian Tek leaders. For this reason the people of each community set aside a day for the collective feasting of these spirits by offering meals. Pho To Kong (Pudugong 普度公) is a leading figure of this ritual. Deemed the representative of hell, he is placed at the end of offering tables. A small image of Kuan Im is put on the head of Pho To Kong, after which songkeng is performed to start the ceremony. Then this bloodthirsty demon of hell is transferred to a subordinate or to another incarnation of Kuan Im, called Kuan Im Tai Su (Guanyin Dashi 觀音大士). Pho To Kong receives offerings on behalf of the dead and, in return, gives blessings to the living before he is finally burned and sent off from the coast at midnight. Public recognition, community goodwill, and some fame can be gained by donating money to this [Tianhua Hospital] and other organizations in the Chinese community. . . . These are the customary ways by which the Chinese community recognizes beneficence. The reports of the Poh Tek Associations, for example, list all contributions, large and small alike, pointing out for special mention those who have given large sums. All Chinese hospitals and charitable associations, and even some dialect associations, honour benefactors by hanging their framed pictures in conspicuous places on the premises. This form of recognition shows the part that charity plays in attaining social prominence in the community. Recognition of beneficence in Coughlin’s term corresponds to thambun in Phuket. Both of them share the same coverage and function. In this regard, the Sangha (consisting of Buddhist temples and monks) is by no means the sole center of merit-making. The wide range of occasions for thambun to take place may seem puzzling in its inclusion of apparently secular activities and facilities. However, when we recall that Chinese temples and related activities are placed outside of “religion,” we realize that the distinction between “religion” and “non-religion” is already obscure. It makes no sense then to claim that Chinese temples can be centers of merit-making while other “secular” organizations may not. It is this blurring of the categories of “religion” and “non-religion” that should be examined instead of questioning the status of the “field of merit” of the Red Cross and other associations. Chinese temples do not have a monopoly on the domain of “non-religious places” for practicing Chinese religious tradition. Other related facilities, whose functions overlap those of Chinese temples, also offer occasions for worshipping Chinese deities. One example of the complexity of the issue is the boundary between temples and associations. A good example is the Hainanese Association (No. 16 in Table 7). Its Chinese name (Hainan Huiguan 海南會館/Kengjiu Huiguan 瓊州會館) gives the impression that it is nothing other than an association by place of origin. Interestingly though, its Thai name is Sanchao Hailam, meaning “Hainanese temple,” and it is officially registered as a private temple. On the other hand, the Hokkien Association in Phuket is not a registered temple, but it contains a worship altar and claims Pun Thao Kong or Fude Zhengshen as owner of the association. Yet these two associations actually share the same functions as places of worship and care of descendants. We can make the same observations of philanthropic foundations. Qing Pu Dong 清普洞 (No. 50) is a worship building of the Phuket branch of the Kuson Tham Foundation, one of the major Chinese philanthropic foundations in Thailand. This foundation has the character of a new religion worshipping He Ye Yun Fozu 何野雲佛祖, a former Mahayana monk in Mainland China, as its founding father, and the structure of the building is similar to that of other Chinese temples; yet Qing Pu Dong has never been registered as a religious place or a Chinese temple. Here we should note that some of the other Chinese temples in Phuket are also registered as philanthropic foundations. Temples No. 1, 5, 7, 8, 19, and 24 (Table 7) are such examples, and they run the gamut of Chinese temple categories, namely, state temple, private temple, and non-registered temple. In fact, there is no clear distinction between these non-registered Chinese temples and philanthropic foundations such as Kuson Tham. Formoso (1996, 255) points out that Chinese philanthropic associations in Thailand are less likely to officially declare themselves as religious organizations. Although the foundations keep alive in Thailand a Chinese religious tradition, this is not their official purpose. The objectives they present to the authorities include material assistance to the poor and emergency relief for victims of fires, flood, and other disasters, and they give maximum publicity to these activities. Li Daoji (1999, 246), who based his research on 510 Chinese associations in Thailand that appeared in a local Chinese newspaper of 1988, highlights the fact that out of 78 associations engaged in religious activities, 73 are philanthropic associations. This figure demonstrates that such self-proclaimed “secular” philanthropic associations provide fields of religious activities to supplement Chinese temples as “non-religious places.” As I have mentioned earlier, even more “secular” organizations such as Chinese-owned hospitals have overlapping functions with Chinese temples and semi-religious (but officially secular) associations as centers of worship of Chinese deities and of merit-making for Chinese statistical Buddhists. As part of the Chinese system, Chinese Buddhism is also closely associated with Chinese Religion, especially from the point of view of worshippers who do not draw an exclusive boundary between what is Buddhist and what is indigenous Chinese, or distinguish between what is Chinese Religion and “pure” Buddhism. Chinese Buddhism, as a part of the anonymous Chinese Religion in a broader sense, forms a stark contrast to the Theravada Sangha protected by the state. This setting of Buddhism in Thailand, which detracts from the state Sangha as the sole organization representing Buddhism, further contributes to the in-between status of Chinese temples, resulting in a puzzling state in which Chinese temples are “non-religious” but their followers are Buddhists. Yang’s classical model of traditional Chinese religion seems to be applicable to the situation of the Chinese temples in Thailand. He employs the term “diffused religion” to explain the special character of traditional Chinese religion as compared to “institutionalized religion.” Diffused religion in his sense is a religion scattered and embedded in various secular social institutions with no significant independent and separate existence (Yang 1991, 294–295). “Chinese Religion” is likely to have operated outside state control since the imperial period of traditional China, where political authority paid little attention to theological issues of dissident sects. Actually, “some 84 percent of the temples in China in the seventeenth century were built without official permission, and this figure obviously did not include the numerous small shrines privately built” (ibid , 214–215). Such a “diffused” nature of Chinese religion might be advantageous in some respects when it is transplanted in Southeast Asian socio-political environments. For example, in Malaysia, where government concern in religious affairs is almost solely concentrated on Islam as a state religion, Chinese Religion enjoys relative freedom and flexibility in a diffused and syncretic form (Tan 1995, 154; Ackerman and Lee 1988, 52). Yang (1991) describes Chinese Buddhism as an example of “institutionalized religion”—an opposite counterpart of “diffused religion,” since the former has a (relatively) more institutionalized monkhood and theology as compared to the latter. However, in some Southeast Asian countries, even such a religious tradition originally oriented to institutionalization has been incorporated into the syncretic amalgam of “diffused religion.” One of the causes is the indifference of the local governments toward non-state religions. Thailand is unique in its divide is between “State Buddhism” and others. The fact that Buddhism of the Theravada school is the de facto state religion has meant that most “Chinese Buddhism” is categorized as “Chinese Religion,” and hence “non-religion” in official state administration. Buddhism is generally considered to be one of the major religions, if not the major religion of multiracial Singapore. But on closer examination, one discovers that the word “Buddhism” is actually used as a religious label by a variety of people in Singapore whose religious practices and beliefs do not necessarily correspond to those prescribed by the Buddhist scriptures. . . . About 50 percent of Singapore’s population declare themselves to be “Buddhists.” But despite their usage of a single religious label, the “Buddhists” of Singapore do not in fact share a unitary religion. As we shall see, “Buddhism” of Singapore shows such a range of beliefs, practices and institutions that it can be structured analytically into distinct and separate religious systems. Our overview of the state of Chinese temples in Thailand tells us that Thailand is not as far off from the Singaporean case as we would expect—at least in terms of the hybrid variety of Buddhism and related traditions. “Thai Buddhism” appears as a unitary religion simply because unorthodox Buddhism-related traditions are, with the exception of a very small number of Mahayana temples, practiced outside “religion.” This ambiguous usage of “Buddhism” at the statistical level reflects a broader definition that encompasses the official structure of the government policy towards religion. Again, Wee’s following comment on Singaporean Buddhism can also be applied to Thailand. We commonly understand Thailand to be a Buddhist state (in this context, Buddhism denotes exclusively Theravada Buddhism), and through “common sense,” we equate the worship of deities in Chinese temples with religion. Yet this “logical” understanding is only partially true. In the first place, statistical Buddhists encompass a very wide section (over 90 percent) of Thai society, and many religious traditions other than Theravada Buddhism have been incorporated into this “Buddhist” state. The second assumption also becomes questionable when we examine official religious discourse in Thailand— followers of Chinese temples are regarded as Buddhists, while the temples themselves have no room in the officially defined domain of religion. Chinese temples as “religion-as-non-religion” are by-products of the formation of the “Buddhist ecclesia” (Ishii 1986) and the institutionalization of religion, two processes that are closely associated. As such, religion was re-defined to denote officially recognized institutions with doctrine and ordained specialists. The result is that this narrow concept of religion has left a very large residual domain. The case of the Chinese temples in Phuket shows that differentiation between religion and non-religion, and differentiation among institutionalized religions, remains minimal on the practical level. We have also seen how previous arguments on “Thai Buddhism” seem to have relied on this unrealistic definition of religion. At the same time, the state of Chinese temples lying outside religion is beneficial to both institutionalized religions and Chinese temples. The state and institutionalized Buddhism can absorb the attendants of Chinese temples into the statistical category of Buddhism to maintain the uniform image of “Thai Buddhism.” On the other hand, Chinese temples can enjoy freedom from state intervention without challenging the official claim of the purity of state Buddhism. Also, since they are not recognized as representing religion, they are not forced to select any one institutionalized religion through which to “purify” their pantheons. This contributes to the persistence of indiscriminative syncretism in the grassroots practices of Thai Buddhism. This brief case study of Chinese temples implies that many facilities for religious activities still remain outside “religion” and “religious places.” Comparative studies on the worship facilities of self-claimed Buddhists in Thailand, such as the Chinese, the highlanders, and other ethnic minorities, as well as the Thai-speaking peoples, will disclose similar discrepancies between official categorization and actual religious practice. My hypothesis is that the vitality and energy of the religious landscape of Thailand originated from this very discrepancy, although a brief overview such as presented in this paper is only a first step toward proving it. Boonsanong Punyodyana. 1971. Chinese-Thai Differential Assimilation in Bangkok: An Exploratory Study. Ithaca: Cornell University Southeast Asia Program. Cheu Hock Tong. 1992. The Datuk Kong Spirit Cult Movement in Penang: Being and Belonging in Multi-Ethnic Malaysia. Journal of Southeast Asian Studies 23(1): 381–404. Cohen, Erik. 2001. The Chinese Vegetarian Festival in Phuket: Religion, Ethnicity and Tourism on a Southern Thai Island. Bangkok: White Lotus. Coughlin, Richard J. 1960. Double Identity: The Chinese in Modern Thailand. Hong Kong: Hong Kong University Press. Cushman, Jennifer W. 1991. Family and State: The Formation of a Sino-Thai Tin-mining Dynasty 1797–1932. Singapore: Oxford University Press. ―. 1989. Revenue Farms and Secret Society Uprisings in Nineteenth-Century Siam and the Malay States. Review of Indonesian and Malaysian Affairs 23: 1–15. DeBernardi, Jean. 1984. The Hungry Ghosts Festival: A Convergence of Religion and Politics in the Chinese Community of Penang, Malaysia. Southeast Asian Journal of Social Sciences 12(1): 25–34. ―. 1996. Chinese Temples and Philanthropic Associations in Thailand. Journal of Southeast Asian Studies 27(2): 245–260. Heinze, Ruth-Inge. 1983. Automatic Writing in Singapore. Contributions to Southeast Asian Ethnography 2: 146–159. Ishii, Yoneo. 1986. Sangha, State, and Society: Thai Buddhism in History. Translated by Peter Hawkes. Honolulu: University of Hawai‘i Press. Kershaw, Rodger. 1981. Towards a Theory of Peranakan Chinese Identity in an Outpost of Thai Buddhism. Journal of the Siam Society 69(1–2): 74–106. Keyes, Charles F. 1989. Thailand: Buddhist Kingdom as Modern Nation State. Bangkok: Editions Duang Kamol. Koizumi Junko 小泉順子. 2007. Shamu ni okeru Chugokubyo ni kansuru Ichi Kosatsu: “Byo ni kansuru Shorei” (1921 nen) o megutte シャムにおける中国廟に関する一考察― 廟に関する省令」（1921年）をめぐって [Chinese shrines in Siam in historical perspective]. Toyo Bunka Kenkyujo Kiyo [The Memoirs of the Institute for Advanced Studies on Asia] 150: 17–52. Li Daoji 李道緝. 1999. Taiguo Huashe de Bianqian yu Fazhan 泰國華社的變遷與發展 [Transformation and development of Chinese associations in Thailand]. In Maixiang Ershiyi Shiji Haiwai Huaren Shimin Shehui zhi Bianqian yu Fazhan 邁向21世紀海外華人市民社會之變遷與發展 [Transformation and development of overseas Chinese civil society toward the 21st Century], edited by Chen Hongyu 陳鴻瑜, pp. 229–252. Taipei: Zhonghua Minguo Haiwai Huaren Yanjiu Xuehui. Lim, Francis Khek Gee. 2012. The Eternal Mother and the State: Circumventing Religious Management in Singapore. Asian Studies Review 36(1): 19–37. Mohamed Yusoff Ismail. 1993. Buddhism and Ethnicity: Social Organization of a Buddhist Temple in Kelantan. Singapore: Institute of Southeast Asian Studies. Nipaporn Rachatapattanakun ニパーポーン・ラチャタパタナクン. 2012. Kindai Bankoku ni okeru Kokyo Jigyo: Doro Kensetsu, Eisei Kanri Chiku, Koshu Eisei 近代バンコクにおける公共事業―道路建設・衛生管理地区・公衆衛生 [Public service in modern Bangkok: Road construction, sanitation district, and public health]. PhD dissertation, Kyoto University. Phuwadon Songprasert ภวดล ทรงประเสฐิ. 1988. Buranakan haeng Chat lae Kandamrong Khwampen “Chin” nai Boribot khong Prawattisat Phak Tai บูรณาการแห่งชาติและการดำรงความเป็น’จีน’ในบรบทของประวตั ศาสตรภาคใต้ [Repairing the nation and persistence of “Chineseness” in the historical context of the South]. In Roirao nai Sangkhom Thai? : Buranakan kap Panha Khwammankhong khong Chat รอยราวในสงั คมไทย? : บรณาการกบปญัหาความมนั คงของชาติ [Cracks in Thai society? : Repairing and problems of national security], edited by Kusuma Sanitthawong na Ayutthaya กสุ มาสนิทวงศ์ ณ อยุทยา, pp. 177–212. Bangkok: Sathaban Suksa Khwammankhong lae Nana Chat, Chulalongkorn University. ji Zongjiao Xisu de Diaocha 曼谷與新加坡華人廟宇及宗教習俗的調査 [A survey of temples and religious practices of ethnic Chinese in Bangkok and Singapore]. Taipei: Academia Sinica. Prasit Phong-udom ประสทธ์ิ พงศอ์ ดม. 1984. Prawattisat Sapha Khritchak nai Prathet Thai ประวตั ศาสตรสภาครสิ ตจกั รในประเทศไทย [History of the Church of Christ in Thailand]. Bangkok: Church of Christ in Thailand. Sutthiwong Tantayaphisalasut สทธวงศ์ ตนตยาพศาลสทธ.ิ 2001. Khwampenma khong Krom Kansatsana lae Ngan Phra Satsana ความเปนมาของกรมการศาศนาและงานพระศาสนา [History of the Department of Religious Affairs and Buddhist works]. In Rai-ngan Kansatsana Pracham Pi 2544 รายงานการศาสนาประจำปี ๒๕๔๔ [Reports of Administration of Religious Affairs in B.E. 2544], pp. 3–30. Bangkok: Krom Kansatsana, Krasuang Suksathikan. Tambiah, S. J. 1976. World Conqueror and World Renouncer: A Study of Buddhism and Polity in Thailand against a Historical Background. Cambridge: Cambridge University Press. Tan Chee Beng. 1995. The Studies of Chinese Religions in Southeast Asia: Some Views. In Southeast Asian Chinese: The Socio-Cultural Dimension, edited by Leo Suryadinata, pp. 139–165. Singapore: Times Academic Press. ―. 1990. Chinese Religion and Local Chinese Communities in Malaysia. Contributions to Southeast Asian Ethnography 9: 5–27. Thailand, Krom Kanpokkhrong กรมการปกครอง. 2000. Thamniap Thabian Sanchao Thua Racha-anachak ทำเนยบทะเบยี นศาลเจาทวั ราชอาณาจกั ร [Directory of Chinese temples in the kingdom]. Bangkok: Krasuang Mahatthai. Thailand, Krom Kansatsana กรมการศาสนา. 1998. Rai-ngan Kansatsana Pracham Pi 2540 รายงานการศาสนาประจำปี๒๕๔๐ [Reports of Administration of Religious Affairs in B.E. 2540]. Bangkok: Krom Kansatsana, Krasuang Suksathikan. Thailand, Samnak-ngan Khana Kammakan Kansuksa haeng Chat, Samnak Nayok Ratthamontri สำนกั งานคณะกรรมการการศกษาแหง่ ชาติ สำนกนายกรฐั มนตร.nี 2000. Rai-ngan Sathiti dan Satsana khong Prathet Thai Pi 2542 รายงานสถติ ดิ านศาสนาของประเทศไทย ป๒๕๔๒ [Statistical report of religion B.E. 2542]. Bangkok: Office of the Prime Minister. Tobias, Stephen F. 1977. Buddhism, Belonging and Detachment: Some Paradoxes of Chinese Ethnicity in Thailand. Journal of Asian Studies 36(2): 303–326. Vella, Walter F. 1978. Chaiyo! : King Vajiravudh and the Development of Thai Nationalism. Honolulu: University of Hawai‘i Press. Wee, Vivienne. 1976. “Buddhism” in Singapore. In Singapore: Society in Transition, edited by Riaz Hassan, pp. 155–188. Kuala Lumpur: Oxford University Press. Wells, Kenneth E. 1958. History of Protestant Work in Thailand, 1828–1958. Bangkok: Church of Christ in Thailand. Yang, C. K. 1991. Religion in Chinese Society: A Study of Contemporary Social Functions of Religion and Some of Their Historical Factors. Taipei: SNC Publishing. 1) Tambiah (1970) is representative of the pioneer works on this subject. In general, anthropologists working on Buddhism in Thailand tend more or less to stress the diversity of religious practices outside the Sangha. 2) “Thais believe themselves to be born Buddhists, that the words Thai and Buddhist are synonymous”(Ishii 1986, 39). For another example, see Keyes (1989). 3) Surprisingly enough, more attention has been paid to the role of the Chinese in Theravada Buddhism in Malaysia than in Thailand. It has been pointed out that in Kelantan, the Chinese and Thai maintain a symbiotic relationship in support of the Theravada Buddhist tradition there (Kershaw 1981; Mohamed Yusoff Ismail 1993). In Thailand, Boonsanong (1971) and Tobias (1977), for example, argued the Chinese acceptance of Thai Buddhism. However, the place of Chinese temples within “Thai Buddhism” as a system has not received sufficient attention from scholars in Thai studies. 4) Tambiah (1976, 370–379) analyzes the role of the Department of Religious Affairs in the Sangha administration, although he hardly mentions the Department’s control of non-Buddhist religions. 5) One such temple is a samnaksong, which has lesser status than an official monastery (wat). 6) For a more nuanced understanding, I have to point out that the religious nature of Chinese temples has not always been neglected by the authorities. Article 12 of the ministry’s order on sanchao states that managers of each sanchao shall include faith (khaorop napthu) in its teaching (latthi). As this statement shows, the government knows full well that the activities of Chinese temples are carried out according to religious belief. However, my point is that, even though the religious nature of Chinese temples is recognized by the government, they have no place in officially defined religion and are supervised in “secular channels” only. 7) For details of the modern history of Phuket and the role of the Chinese, see Phuwadon (1988) and Cushman (1989, 1991). 8) Wee (1976, 173) states categorically that such extension is not applied to Islam and Protestant Christianity, since these religions do not have images. Nevertheless, the very existence of the Datuk Kong worship in Malaysia, which corresponds to the worship of to in Phuket, proves that some kinds of Islamic beliefs can be re-interpreted by and incorporated into Chinese Religion. For details of Datuk Kong worship see Cheu (1992). 9) Currently, daoshi, the Taoist specialist is absent in Phuket (Cohen 2001, 186). 10) This ritual is also called the Hungry Ghost Festival (DeBernardi 1984). 11) The absence of resident monks in temples was not exceptional in traditional China. See Yang (1991, 309–310). 12) Automatic writing is a way of divination popular among the Chinese in Southeast Asia. See Heinze (1983) for details. 13) See “Introduction” to this special issue. 14) Actually some Hindu temples and shrines in Bangkok (for example, the so-called “Wat Khaek” at Silom) are full of Chinese worshippers who would claim to be Buddhists.